Mt Tongariro erupted just before midnight on Monday night, creating three new craters on its northern slopes. Mt. 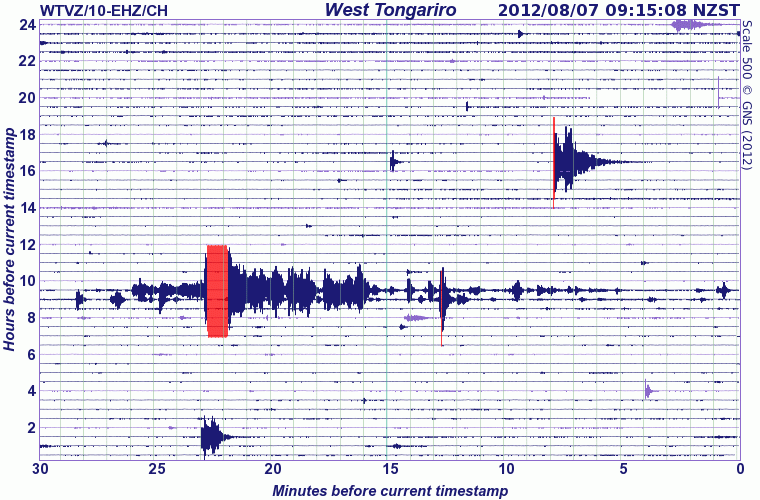 Tongariro in the central North Island erupted at 11:50 p.m. on Monday August the 6th. The brief eruption, which lasted only a few minutes, ejected mud, rock and ash from three new craters which opened near Te Mari craters, the site of the last significant eruption which ended in 1897. The volcano typically experiences two volcanic earthquakes per year, but this changed on July 13th this year. Unrest has occurred on occasions, most recently in 2001. However, this latest activity had an initial burst, eased, then began again on July 18th, increasing over the next two days. The earthquakes were small, generally below magnitude 2.5 but were accompanied by the release of volcanic gas. The earthquake activity continued into August but events declined in size and number. By Monday August 6th there were fewer than five events per day, clustered 2-7 km below Emerald Lakes and Te Mari craters. This changed abruptly at 11:50 p.m. that night when a sudden eruption threw blocks of material up to 1 metre in size as far as 1.5 km from three new craters. The eruption was driven by steam rather than molten rock, and ash was ejected as far as Lake Rotoaira. An ash plume rose above the volcano, drifting eastward over Hawkes Bay and out to sea. A fine coating of ash settled to ground level at some locations in Hawkeâ€™s Bay. The eruption triggered aviation restrictions to nearby airports but services to all regional airports except Napier were restored by Monday night. This image of the West Tongariro seismograph published on the GeoNet website indicates that there were about three minutes of minor volcanic tremor before the eruption (which appears as the red bar) on Monday night. Six minutes later earthquake activity had declined considerably. The earthquake shown seven hours earlier in the upper right of the image is an unrelated tectonic event. Weather conditions in the area made reconnaissance difficult on Tuesday, but a brief period of good weather on Wednesday morning allowed scientists to make an observation flight over the volcanoâ€™s lower slopes. They found actively steaming vents at a new crater area below the upper Te Mari crater. No vents had opened in or around the lower Te Mari crater or at lower levels on the mountain. Previously steaming ground at the Ketetahi thermal area and lower Te Mari crater was more vigorous, but there were no obvious other changes. Blocks of old lava and hydrothermically altered lava up to a metre in size had been ejected by the eruption. There are extensive areas to the east and west of the new vents where falling material has formed impact craters in the ground. No burnt vegetation was seen. No steaming blocks were seen, with material being angular and typical of old rock rather than fresh lava or scoria. Ash cover on the ejected blocks suggests that they were ejected after the main ash-producing phase of the eruption. No lahar was generated, but a debris flow partly fills a stream valley draining from upper Te Mari crater. New rock falls near the new vents are a sign that significant ground shaking took place during Monday nightâ€™s eruption. The fact that the eruption occurred with no warning reinforces vulcanologistsâ€™ warnings that further activity could occur without warning. Whilst GNS science was able to raise the alert status for Tongariro on July 20th, it was not possible to indicate that the volcano was on a path leading to an eruption. Unlike quieter volcanic areas where the magma lies some distance under the volcanic vents, Ruapehu, Ngauruhoe and Tongariro are more active and the molten rock sits at a higher level under them. There are active thermal fields, and eruptions are more frequent. The result of a small change in the field is more rapid, with the escape of abruptly heated water having spectacular results as Mondayâ€™s steam-driven eruption shows. For the same reason, vulcanologists appear to be hedging their bets in saying that activity could decline, continue or escalate to a magmatic eruption. This is simply the way that these volcanoes are. If magma began moving slowly, there could be warning from increased volcanic earthquake activity, but there are many other aspects of volcanic activity that could trigger a dramatic eruption with little or no warning. The Volcanic Alert Level at Mt. Tongariro remains at Level 2, but the Aviation Colour Code has been reduced from Orange to Yellow because of the decline in ash being emitted. Close study of earthquake activity and gas emissions continues, to determine where this period of activity is leading. This has been hampered by the weather conditions and the apparent destruction of a temporary seismograph that was installed at Te Mari in July. The device was buried underground but, as luck would have it, it was probably too close to one of the new vents that opened during this latest eruption. This entry was posted on Thursday, August 9th, 2012 at 2:04 pm and is filed under Eruptions - Observations. You can follow any responses to this entry through the RSS 2.0 feed. You can skip to the end and leave a response. Pinging is currently not allowed.